Several people have asked me if I ever sell my quilts. My answer is usually that I have tried to sell them but it is almost impossible to get anyone to pay what they are worth. What I mean by that is that hand quilting can NOT be compared to machine quilting when it comes to the time invested, but people think that it should be the same in selling price. 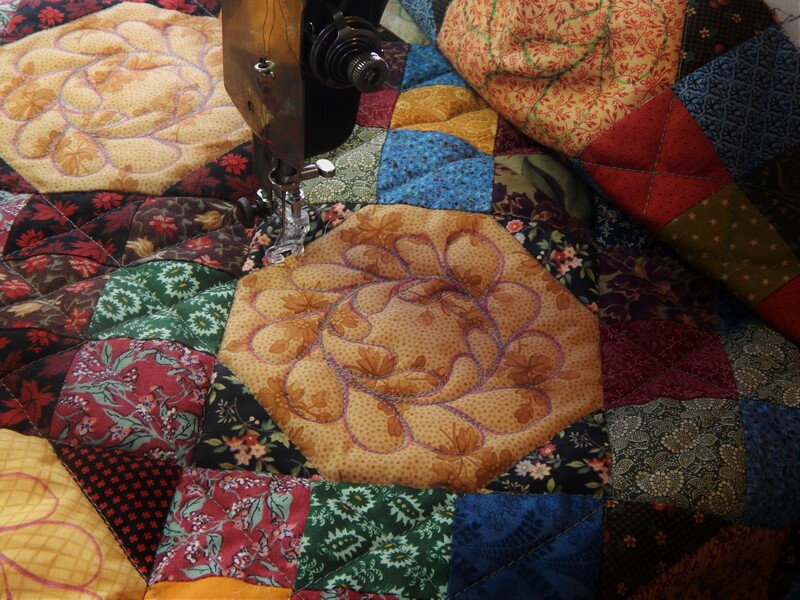 A quilt can be machine quilted in a rather simple pattern in a day. I can get a quilt basted for hand quilting in a day. They just are not the same. 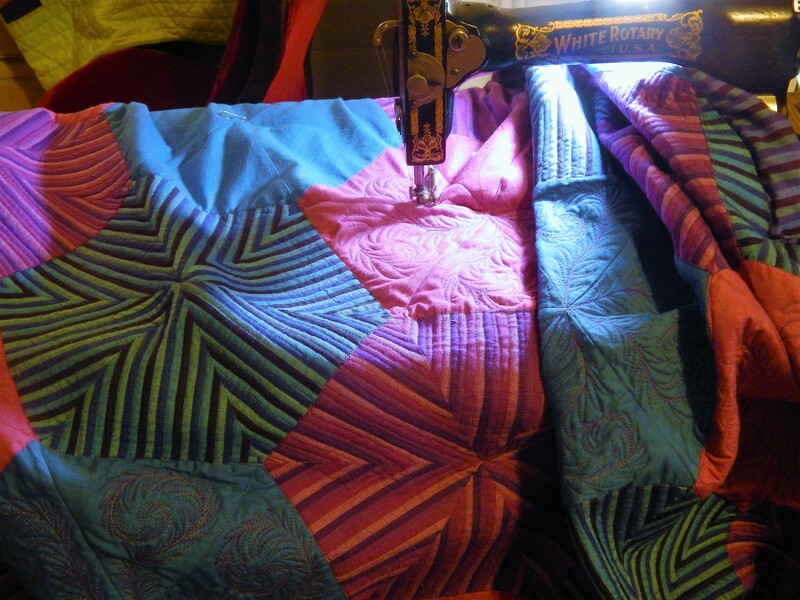 I hand quilt because I enjoy it, and I love the look of hand quilting, so If I never sell any more I can live with it. But what is hand quilting worth? I get all of my quilts appraised by and American Quilters Society certified appraiser. One of the things she has to do when assigning a value to one of my quilts is to determine what it would cost to hire someone to hand quilt a similar quilt in a similar pattern. There are several places that will do hand quilting…do an internet search for hand quilting services…and they generally charge for quilting based on the number of yards of quilting thread used. The quilters cut the thread into 1 yard lengths and keep a count of the threads used. The charge is about $1.50 per yard of thread. I took the last yard off of another roll of thread today while working on my whole cloth quilt. That makes 1200 yards so far. If I were paying to have the quilting done my bill would now be up to $1800. my guess is that I have an additional 800 + yards to go so the quilting would cost $ 3,000. I don’t think I would ever want to sell this quilt but if I did I don’t think I could ever get anywhere near the actual monetary value. In the end I don’t think the value is in the money. There is so much more to a quilt than cost. This entry was posted in Quilts and tagged cost of hand quilting, hand quilting, Quilts, vlaue of quilts. I agree. Well written, Tim. So often people do ask why don’t you do these to sell? Just as you said above, no one wants to pay the price of what the work actually costs the quilter in time and supplies. I quilt for family and friends, weddings, births, anniversaries. You can’t make back what you put into a beautiful quilt like the ones you show here. I don’t think people understand that. They always do that “tilting the head” thing and don’t understand when you try to explain. They say, “but surely someone would pay $300 or $400 for a quilt like that!” and just don’t get it when I explain the cost of the fabric, batting, thread, and your TIME. What can you say….they just don’t understand. I agree with you completely. There is, to me, nothing more beautiful than a hand-quilted quilt. The little dimples, the softness, and just knowing the time and patience that quilt required makes them really priceless. Thanks for another great post. thanks Barbara! glad that hand work is still appreciated!! it is hard to put a price on hand quilting. it is so different from machine quilting. If a person wants to sell a hand quilted quilt though you have to get past what you think it is worth and decide if you really want to sell it and then just put a price on it that you think would sell. I have sold 3 queen size quilts and tons of baby & couch size quilts and none of them did I put a price on it that I really thought it was worth but more what I thought I could get for my area – each area of the country is different – what kind of income do people in your area make? if you price things really, really high they will never sell unless you are a really well known person in the quilting world 🙂 I am normally satisfied with the prices I get for my quilts – because I am not trying to support my family on my quilting — I am however supporting my hobby by making enough to pay for almost everything I buy to make my quilts each year and still have plenty of quilts left over to enjoy and give away. You said: A quilt can be machine quilted in a rather simple pattern in a day. More like an hour and a half…. I have made a few quilts that I consider heirloom… and the daughter that divests herself of those before I am gone will be on my crumb list for a very long time….. much rather have the quilt back if storing and using it is a problem. But your whole cloth quilt is in a much different league so I would not be surprised if “one day” a collector pays thousands of dollars for it. Thanks!….I will wait for the right person who is willing to compensate for the value! Hi Tim. I do so agree with you on the hand quilting front. And in my opinion this one would be in the priceless category. It’s just so beautiful…and all those hours you have put into it. Just lovely. Speaking as a certified AQS appraiser I can tell you this…..the whole thing is based on what the current market will bear. I am finding that very few people hire out to hand quilt as compared to the dearth of machine quilters out there – and yet most who do hand quilting do not get what many invoices I see show for the fees charged ( and paid) by today’s long arm quilters – esp. those doing custom ‘heirloom’ work. I remember in my early appraiser days telling a hand quilter that she wasn’t charging enough and she said, ‘that’s all I can get’….and that, like it or not, is what we mean by ‘current market’. It takes much longer, etc etc…..if the public doesn’t value it and therefore PAY for it, those that do it for hire have to take what they can get – and most seem to stop doing it because of that. I am completely in love with all of your quilts, but your whole cloth ones are absolutely exquisite. I also agree with everything you have so eloquently written in this post. Back in the day, I used to do quite a bit of hand smocking and French handsewing for the marketplace, and I can tell you that very few people are willing to pay for the time and difficulty – not to mention the skill level – involved in fine needlework of any kind. Everyone wants it, but getting a fair price for it is nearly impossible. Hand quilting is certainly an example of this. I’ve just started quilting in the last year or so, and you are at the very top of my “inspiration short list.” Thanks, Tim! Thanks for this fine piece. It provokes us to think again about what we value of a quilt. Do we want an ever-growing pile of finely wrought tops that have been industrially quilted? do we want finely wrought tops that are finely hand quilted? What makes a really fine quilt? In many parts of the South and Midwest, there is a 20th-century tradition of a maker’s producing a top and then handing it off to someone who specializes in quilting to finish it. Prices, generally based on the number of spools of thread used, have always run from nominal to mildly costly to expensive, if we want fine quilting. But few have ever really paid a “living wage” for such work. Now everyone must make a decision about what really creates the value we desire in a given quilt, for the quilting process is more costly. There are some things for which real value cannot be measured in cash in the present time, though cash value seems more reasonable with their age. This piece makes us apply all those fine words we accord to the value of an predecessors’ time and ask ourselves how we measure up by them. I appreciate your raising the questions, showing the current possibilities, and generally addressing the value of the much neglected subject of hand-quilting. Another appraiser chiming in here. I remember twenty years ago when machine quilting created a surface much like a mattress pad, quilters with a backlog of tops were happy to pay the then going rate of $80-$90 to have a top quilted. Today, many of my clients are providing receipts for as much as $900 for longarm quilting. I write appraisals day after day and week after week for these quilts. I ‘m sure there are those who cannot afford to pay that much for the service, but the number of appraisals I write suggests that many people are, indeed, paying this much for the service. great post and your right the value in a quilt is what someone would be willing to pay as well in the end. I think you should start considering entering your hand quilted quilts into shows with prize money. This quilt would win I bet. Love today’s post about what hand quilting is worth. Those that don’t hand quilt, don’t get it. I recently heard someone say that the newest luxury is “Hand Made.” I own a small shop that often has machine quilted quilts and people are appalled at a price of $700 to $1,000 for a quilt. I quote hand piecing, fabric, batting, backing and the cost of quilting as being a factor and they still don’t get it. I am a hand quilter and never sell anything I make. I know that no one would ever be willing to pay me for my time much less the love I put into my quilts. I was happy to see the breakdown of what hand quilting would cost as I thought that if I charged it would be exorbitant, but in retrospect, I probably would have been too cheap. 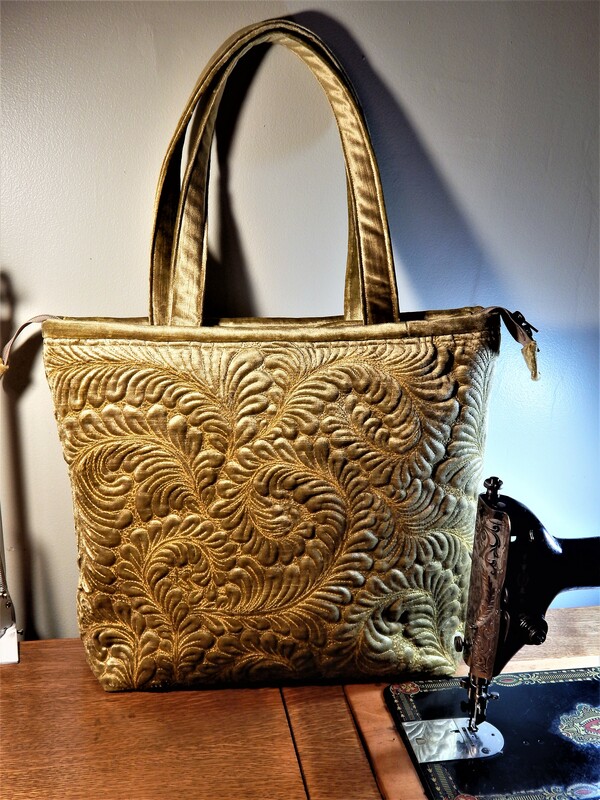 That is so great….the newest luxury is hand made…luxury now was once a necessity. how times change! as you say people dont think $1000 is a reasonable price, but then they would if they made it!….people want “hand made” luxury with factory import prices….Im glad you havent sold your hand quilted treasures for less than they are worth!! people think they can compare the “made in wherever” quilts that they see in the department store with what a talented home quilter can turn out….much more quality, will actually last, and is sooooo beautiful….since i quilt i have had well-meaning friends give me as a gift at times a “quilt” from a department store….saying….”look, I found this one for $45 at WalMart”…..so…they are never going to understand the difference so I just keep on making and enjoying and giving away as gifts….some understand and appreciate your time…but they would never dream of paying at the department store what your quilt is worth. That’s great information, I wouldn’t have known but it makes me want to keep track of the yards of thread I use. I was once told that I would be surprised what some people will fork out for a quilt so maybe it’s about the right buyer at the right time. The cheap chinese quilts have done us a lot of damage when it comes to value in the market, not that I want to seel any of my babies. you are right about those imports destroying the market!! There are several types of ‘value’ – only one is monetary…a price cannot be put on sentimental value and that seems to be what we who love handwork are talking about. Those of us that say a hand quilted piece should ‘get’ more money have to ask ourselves if WE would pay that. Unfortunately, like all things, the $$ value of anything is what someone will pay for it…be it houses or quilts. Actually, the yards of quilting thread used should not matter to an appraiser when estimating a replacement value unless there is proof that you (or those in your area who hire out hand quilting) can verify what they actually get paid for doing the work. One can ask whatever you want to ask for your work….if you get it then that’s what someone will pay. If you never do, then you know that the monetary value to a buyer does not match your sentimental feelings OR the number of hours you have spent or the amount of thread you have used. Cruel world! I am not the right person to ask. I could tell you about hand quilting, but I dont do much applique, and I dont know the pattern. I think the person to set the price needs to be the person who does the work. There is so much food for thought in this post and in the comments. I don’t think there is anything more beautiful than a well pieced and beautifully hand quilted quilt. But putting a price on them is such a difficult thing. I’ve been asked if I’d sell some of my hand-pieced tops to those who want to quilt them and have been absolutely stymied trying to come up with a price to out on them. Tim, I know what you mean about putting a value on your handwork. I spent 2500 hours working on my Dear Jane quilt. It was all done by hand, and since I was only using blues and muslin, I decided to assemble the blocks on point with 144 alternating plain blocks separating the pieced and appliqued blocks, and a prairie point binding instead of the usual scallops that a lot of Dear Jane’s have. It was a real slap in the face to have it valued at only $2800, despite the fact that it won 3 first place ribbons in our quilt show. It definitely didn’t give me any inspiration to enter anything in our next show. Probably as a joke a couple of the guild members had asked me if I was going to put a price on my quilt to see if anyone would show an interest in buying it, so I did. I put $17,000 as a selling price and was told by the appraiser not to expect it to sell since I was asking so much more than what she had appraised it at. I told her that her idea of value had nothing to do with with the price I would be willing to part with it for. I did have two ladies come and ask me questions about it, and both seemed to think I was still selling myself short. I know I did make one humility block in the quilt, but no one has ever found it, and I would be hard pressed to find it again myself. The appraiser had brought her Dear Jane quilt to a trunk show a year or two later that I attended with my niece and her 6 yr old son. When the Dear Jane was lifted up to be shown, the 6 year old picked out two faults in the way the triangle borders fit on two of the sides. Someone asked her what the value of hers was and she said $7,000 and the 6 yr old piped up with a comment about it being worth a lot more than mine was. Out of the mouths of babes. I love looking at your work Tim, it is awesome to say the least. Thanks for visiting my blog!….sharing my work is a lot more fun than trying to sell it!! I found your site when I was trying to price the quilt I am currently working on. I need my head examined and after more than 20 years as a quilter I should have known better. I have enlarged a two year old baby quilt to almost queen size. I originally had done it as a gift for a friendcs first grandchild. They supplied fabric. 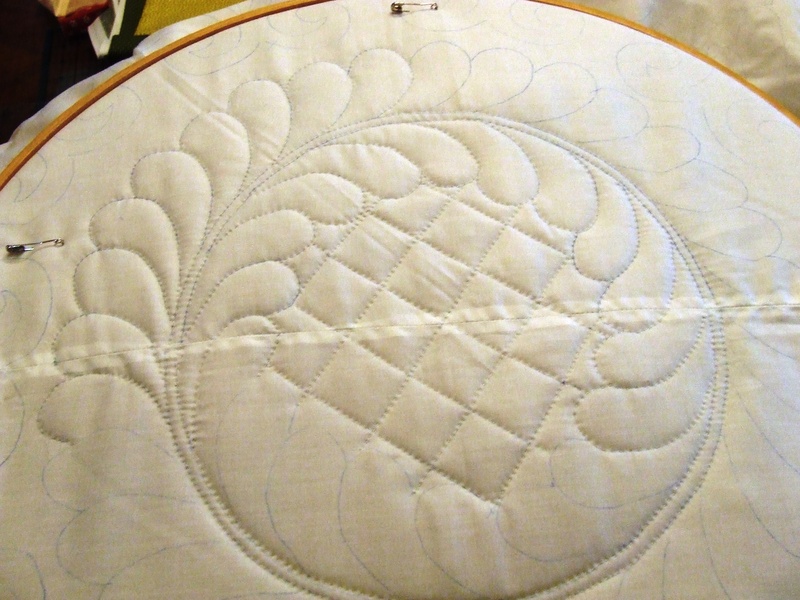 I am almost finished hand quilting it in a hoop as I could not get it on my three rail frame. I was thinking about $250 as I am not completely happy with the backing and will NEVER undertake a project like this again. s she grows up the appliqued bunnies can be rwmovwd to give her a big girl quilt. wow 250 is a real deal!…I know the hours and effort that it took….I am sure that they will really appreciate it!